DanLyn studios came about through a passion for music by Dan Sinasac. Dan designed, built and equipped the facility, which is attached to the back of his log home on 3.25 acres just east of Edmonton, Alberta. The main room has a 30 foot long wall with heavy burgundy curtains that can be opened to look out at the large grassy area and trees beyond, or the white snow depending on the season. The studio has a very comfortable country feeling and as you enter the front driveway onto the property you immediately start to relax. 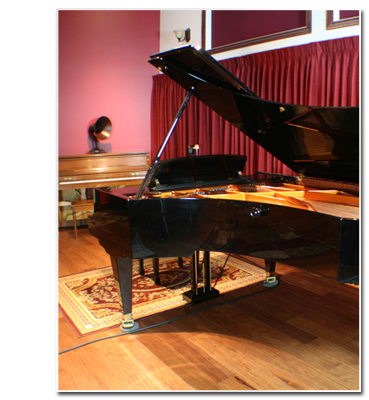 The purpose and/or vision of the studio is to provide a pleasing atmosphere to put visiting musicians at ease and bring out the best they are able to give. With Dan it’s always been about the music, so the studio had to be equipped with world class capabilities. Being “Old School” as they say, I first believe in a good source sound. That means a great atmosphere in a great room, then good mic’s, good pre amps, and a good recording format heard through good monitors. The path is simple but it starts with the musician and his instrument. At DanLyn we hope to provide an environment that will encourage artists to let the real music flow, so we can capture it. A friendly call and chat can answer any questions you may have, we are always up to a challenge.